Watch Zach’s New Clip of Celebrity Whispers! Angelina! Steve Martin! Mark Wahlberg! So much crazy stuff is whispered on the red carpet… check out the latest from Celebrity Whisper and ZS! 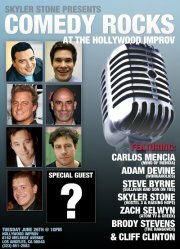 Come see Zach w/ Carlos Mencia, Adam Devine, Skyler Stone and More TOMORROW NIGHT! Zach joins Carlos Mencia, Steve Byrne Adam Devine (Workaholics), Brody Stevens and 3 HUGE SPECIAL GUESTS – tomorrow night at the IMPROV – Melrose Blvd.